We offer airport transfers in a comfortable 8-passenger van. For the guests who make accommodation bookings through our agency - we provide convenient transport from either Rijeka Airport or Zagreb Airport to your holiday accommodation on the Island of Krk. The route between Zagreb Airport and the Island of Krk is 165 km long and it takes approximately 1 hour 45 minutes to reach the island. 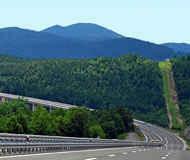 Out of 165 km, the 130 km is on the newly built motorway which leads through one of most beautiful mountain districts of Croatia. Gorski Kotar is often called "The green heart of Croatia" owing to its lush green forests, woodlands and mountain peaks. Island Krk is connected with the mainland with a mile long Krk bridge so there is no waiting for the ferry crossing. From the airport to the door of your holiday accommodation! The price from the airport includes a driver meeting your flight and transfer by air-conditioned mini-bus to the door of your accommodation on the Island of Krk. The price of transfer from Krk Island to Zagreb Airport includes pickup at your accommodation and transfer to Zagreb Airport with plenty of time to board your flight. You should provide us with your flight details when booking the transfer. Flight delay of up to an hour is included in the price. In the cases where the flight arrival is delayed more than an hour, any waiting time longer than one hour will be charged at € 10 / hour regardless of the group size. If the airport transfer booked is cancelled less than 24 hours before agreed pickup time, the full transfer price will still be charged. For the groups of people of 7 or more there is a limit of one large suitcase per passenger.